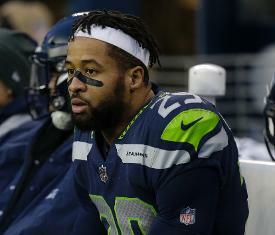 Safety Earl Thomas said Sunday he will not report to the Seattle Seahawks' mandatory minicamp this week as he awaits a new deal with the team. "I will not be attending the upcoming mini camp or any team activities until my contract situation is resolved," Thomas began in his announcement posted on Twitter. "I want everyone especially the 12s to know that I want to remain a Seahawk for the rest of my career but I also believe that based on my production over the last eight years that I've earned the right to have this taken care of as soon as possible. I want to have certainty in regards to the upcoming years of my career." "I'm going to continue to work my craft and put in work so that I can add to the team and give us the best chance to win. I hope my teammates understand where I'm coming from I believe this is the right thing to do," he wrote. The Seahawks drafted Thomas 14th overall in 2010 and watched him flourish as an immediate starter. He has started 121 games with Seattle since, earning six Pro Bowl nods and helping the defensive backfield earn the moniker of "The Legion of Boom." The 29-year-old Thomas, entering the final season of a four-year, $40 million deal signed in 2014, can be fined $84,435 should he miss the entire June 12-14 session. Thomas was discussed in trades, reportedly including the Dallas Cowboys, during an offseason overhaul during which the Seahawks moved on from cornerback Richard Sherman (released) and defensive end Michael Bennett (traded to Philadelphia). Defensive end Cliff Avril was released May 4 with a failed physical designation and strong safety Kam Chancellor's future remains up in the air due to a neck injury. Five other NFL safeties -- including Chancellor -- average more annually than Thomas currently makes, with Kansas City's Eric Berry leading the way at $13 million per year. General manager John Schneider said at the NFL Scouting Combine in February that the Seahawks are embracing the challenge of rebuilding a championship defense. He also said the team knows what it has in Thomas, who was drafted to play a specific and demanding role in coach Pete Carroll's defense. Schneider told a Seattle radio station in April the Seahawks were not pursuing a trade for Thomas.